You Were MEANT To ENJOY Your Life! your energy with the energetic properties of those intentions! Welcome! I am so grateful you’re here with me today! Do you start each New Year with excitement and joy about the life you wish to have but then slowly fall back into your usual life? Do you believe you’d have to devote too much time each day to actually make lasting changes in your life? 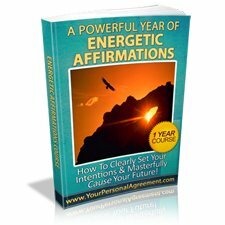 Have you ever worked with affirmations but not gotten the results you hoped for? If you answered “yes” to any or all of the above, you are not alone! In fact, most people have amazing plans and dreams for their lives but they struggle to make the positive (and lasting) changes they wish to experience. Your dreams are what you came here to fulfill! that, deep in your heart, you know you were meant to have. There is this little voice inside each of us that tells us we were meant to live a passionate and inspiring life. That we, too, can have immense happiness, peace and joy. And this voice is right! Yet one of the biggest reasons many people struggle (and fail) at creating the lives of their dreams is because their personal energy is completely out of alignment with the very things they are trying to create. When you dissolve your energetic blocks and resistance to the things you wish to create for yourself, the process of actually achieving those things is very simple. Yes, it takes regular daily practice but it’s a joyful process – NOT an uphill struggle. I’d like to show you how to Clearly Set Your Intentions and Masterfully Cause YOUR Future using this simple yet very powerful 4-step affirmation process. Affirmations are a declaration to the Universe of what you want to create in your life. They are potent and they are very effective, most especially when your personal energetic vibration is aligned with the unique energetic properties contained within the affirmations themselves. Everything is energy. Even words carry their own energetic frequencies. If your energy is not a match to what you are declaring, those declarations cannot manifest in your life. This is a Universal Law and a fact of life. To Aligning With Their Essence. They also naturally shift your energetic vibration to match their own while reprogramming your subconscious mind to start allowing and believing the things you are affirming. This process literally transforms your thoughts and words into tangible, measurable results. If you’ve answered yes to any or all of the above, then this course is most definitely for you! These are the exact areas of life you will devote an entire year to aligning with. You will spend a full month immersing yourself in the energy of each topic listed above as you dissolve any blocks and deeply align yourself with the energetic properties of your wonderful new life. Whether you have had past experience with affirmations or whether you are new to the idea of working with them, this course is very different from anything you may have experienced. This course was specifically designed as a simple yet powerful 4-step process to align all aspects of your energy with the energetic properties of each daily affirmation. This is very powerful yet it’s truly easy to implement into your busy life. Each day, you will spend approximately 10 minutes practicing the first two steps of the process. After that, you will practice the other two steps over the course of your day, incorporating them into your thoughts, words and actions – penetrating your energy on every level. I Want You To Succeed At Creating And Enjoying Your Most Treasured Life…The Life You Came Here To Have! I have created the life of my dreams using these very principles and I absolutely know it is possible for everyone, including you! Whether you start this course at the beginning of a new year, a new month or exactly where you are in your life right now, you no longer need to wishfully dream about the life you came here to have – start aligning your energy with it! Your future is waiting! 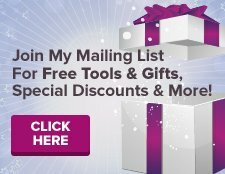 Used These Tools To Masterfully Create Their Lives! Sign up for this 12 month course and immediately start affirming and aligning with the life you are meant to have. Once you have a complete understanding of exactly how to use these tools, you can use them for the rest of your life! Learn how to clearly set your intentions and energetically align with them using this potent 4-step affirmation process. This course goes way beyond traditional affirmation methods. 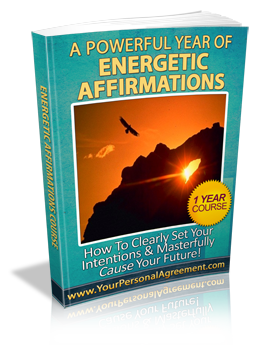 It infuses your own energy with the energetic properties of the affirmations themselves. You absolutely can transform your thoughts and words into tangible results! You Will Get INSTANT ACCESS Right Now – Even If It’s 3.00 A.M.! I have taken great care in assembling the tools that I know from personal experience will help you dissolve blocks or resistance and quickly align your energy with the life you wish to have and were meant to have! I hope you will take this opportunity to align with your intentions and masterfully cause your future! P.S. Please don’t take my word for it – I am far more interested in you hearing from others what these tools have done for them because the bottom line is – it’s the tangible results that matter. I will always honor and respect your right to expect nothing less from us!